These 3 piece towel sets will dress up any bath. Like a fine wine, age improves and the cotton becomes softer with every laundering. Each set includes one 30"x56" embroidered bath towel (Sage 30"x55"), one 16"x30" embroidered hand towel (Sage 20"x30") & one plain wash cloth. 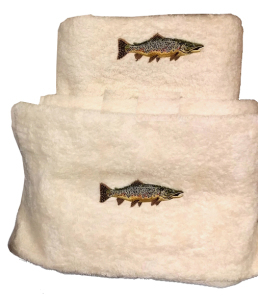 Sage is available with an embroidered Brown or a jumping Rainbow trout with water undereath. Ivory comes with with a Brown trout. Specify Sage/Brown, Ivory/Brown or Sage/Rainbow.